Resene colours can be quickly and easily added to your Photoshop designs using Resene .aco colour files, especially designed for use with Photoshop and related design software, Once loaded the Resene colours can be applied to any part of your design or image - an ideal way to show your clients how selected Resene colours will affect the look of their project. The colour files are both Mac and PC compatible. 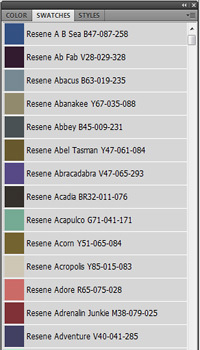 The Resene .aco colour files are arranged as one master file and also separate colour ranges in their own colour file, so you can choose from just the chart range you are working on or view a wider list of Resene colours to choose from. To use the files, simply download and save into your Adobe Photoshop - 'Presets' folder under the 'Adobe Photoshop/Presets/Color Swatches/' (this may be housed in the Application folder 'Applications/Adobe Photoshop/Presets/Color Swatches/' or elsewhere). 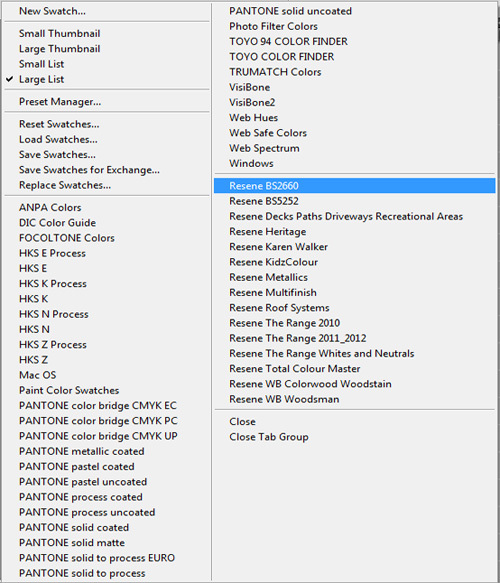 Then open Photoshop and the Resene colour files will be available in the swatches section. PC: To download the file you wish to use, please right click on the file name, choose "Save link as", choose a destination folder ('Adobe Photoshop/Presets/Color Swatches/') and click "OK". NB. The filename extension must be .aco - if '.txt' appears in the filename extension please delete it and type in .aco instead. Mac: To download the file you wish to use, please hold down "Control" and click on the file name, choose "Save link as", choose a destination folder ('Adobe Photoshop/Presets/Color Swatches/'), select "All files" in the 'Save as' field of the dialogue box and click "Save". NB. The filename extension must be .aco - if '.txt' appears in the filename extension please delete it and type in .aco instead.